It brings us no pleasure to report that you need to get yourself a job. Well, you don't need to, but people will like you more, and you'll never run out of things to complain about, so you'll also be a better conversationalist if you get one. Anyway, you do have some choices in the matter: You can choose to make a bunch of money, and you can choose where to make it. In the interest of expressing your agency, check out this list of the 15 cities with the most jobs paying over $100,000 in February. The ranking comes via Ladders, a site that puts out reports like this all the time. While you can't technically just hop on a bus, show up, and start making six figures, it certainly won't hurt your chances to look here as opposed to Normal, Illinois -- no offense to Normal. We're sure it's a lovely place. As a person worthy of a six-figure salary, you've probably already noticed that there's a big gap between the number of jobs at the top of the list versus the bottom. 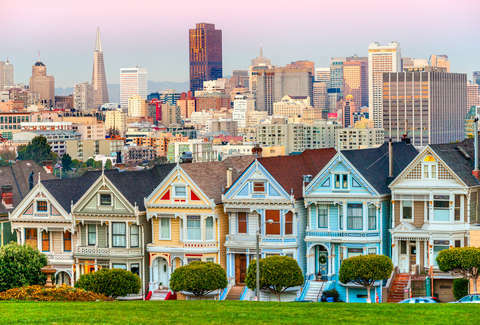 San Francisco has around nine times as many high-paying gigs as Baltimore. But it's important to keep in mind that that's related to the Faustian bargain SF has made with tech, making it more expensive and filled with the bros who keep making it more expensive. So you'll need the money to both afford and justify living there. In Baltimore, you'll have to deal with less of that. The only city here that gives SF a figurative run for its literal money is New York, but that has its own, uh, charms that will make you doubt why you ever moved there in the first place. So we'd advise you to keep an open mind toward the other cities on this list. DC, Boston, Los Angeles, and Chicago all have over 10,000 six-figure jobs open right now. And you'll be able to use all that money you're not spending on rent on things you enjoy. And remember how much you love enjoying things? If you're entirely focused on money and don't care where you live, you should proceed straight to this list of companies with the most jobs paying over $100,000 a year right now.